Owners over water craft up to 2,500 pounds can get the superior quality of Dock Edge manufacturing when looking for mooring whips. 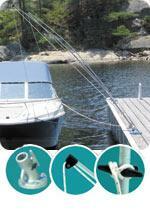 Boatersland Discount Marine Supply has the Dock Side Premium eight-foot mooring whip in stock at a low price. This mooring whip – product number DEI3200F – is perfect for crafts up to 18-feet in length. As an experienced boater, you know that weight is more of a determining factor than the boat’s length when purchasing the proper mooring whip. Dock Edge’s installation instructions are very detailed, enabling you to put your mooring system together without trouble. When you purchase your Dock Side Premium mooring system from Boatersland, you will be getting all of the whip lines and mounting hardware. When the time comes to store your mooring system for the winter, all that you need to do is remove the whips from the bases. Dock Edge recommends that whips be stores in a location that remains above freezing such as a basement or heated garage.